For 147 years, The Ohio State University's campus in Columbus has been the stage for academic achievement and a laboratory for innovation. The university's main campus is one of America's largest and most comprehensive. As Ohio's best and one of the nation's top-20 public universities, Ohio State is further recognized by a top-rated academic medical center and a premier cancer hospital and research center. As a land-grant university, Ohio State has a physical presence throughout the state, with campuses and research centers located around Ohio. Ohio State is #16 among the nation's best public universities; #1 among Ohio publics, and ranked among the top 12 U.S. public research universities and 4th among all universities in industry-sponsored research. Ohio State is also among the schools with the "happiest freshmen,” and named among the top tier of national and international colleges and universities for sustainability. Buckeye engineering students have been crowned the winners in the first, second and third years of the four-year EcoCAR 3 competition. 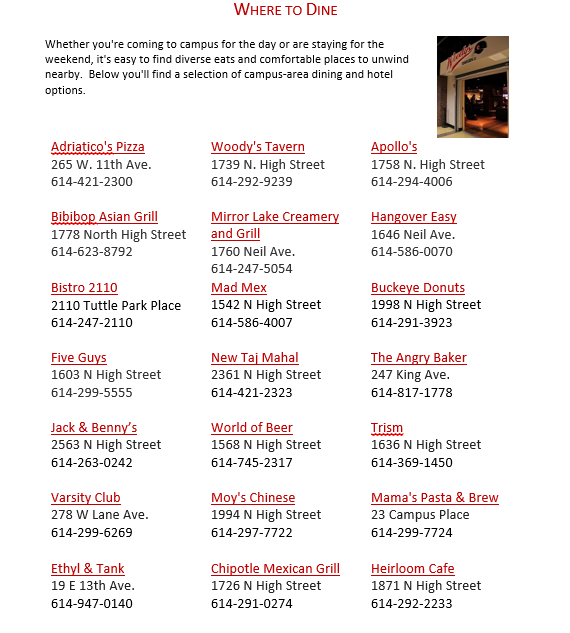 Ohio State has over half a million alumni around the globe, what a way to expand your network! Gallup found that Ohio State alumni are far more likely than graduates of their peer groups to strongly agree that the university was the perfect school for them and that they can’t imagine a world without their school. Ohio State graduates are more likely than graduates nationally to be thriving in all five areas of well-being that Gallup measures: purpose, social, financial, physical and community. Ohio State is made up of a diverse, international community. As the world becomes increasingly interconnected, Ohio State embraces the value of integrating international dimensions across our campus, pursuing international partnerships, and preparing our students to excel in the global marketplace. More than 5,500 international students -- from over 100 countries – call Ohio State home. Ohio State is located in Columbus, the capital of Ohio and the 15th largest city in the United States, with a population of over 1.8 million. 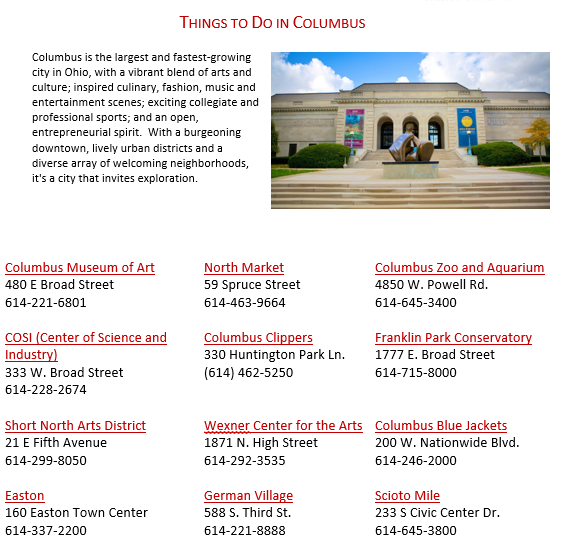 Columbus offers a wide variety of restaurants and shopping, cultural events, places of worship, historic neighborhoods, and major sports and entertainment venues. Learn more about Columbus. Port Columbus International Airport, a 15-minute drive from campus, is served by 10 airlines. Columbus is located only a few hours by air from Atlanta, Boston, Chicago, New York and Washington, D.C.